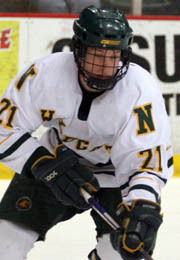 A highly skilled offensive player during his three seasons playing NCAA hockey at Northern Michigan University, Mark Olver signed an entry-level deal with the Avalanche on March 30 and finished the 2009-10 campaign with the Lake Erie Monsters. After leading the Wildcats in scoring during each of his three seasons, Olver will be taking his game to the professional ranks on a full-time basis in 2010-11. ColoradoAvalanche.com recently caught up with the Burnaby, B.C. native to get his thoughts on his time in college, playing in Lake Erie and what he thinks the future holds. You were actually passed over in the NHL Draft on two separate occasions before the Avalanche selected you in 2008. In your mind, what made NHL scouts finally sit up and take notice? How much did the exposure gained from playing at a Division I school factor into that as well? Northern Michigan has had some success in the past, including an NCAA title in 1991. But when the team earned a berth in the NCAA Tournament last season it was the school’s first appearance in a decade. How gratifying was that for you? After the season ended, you began your professional career with the Lake Erie Monsters. What were your thoughts on transitioning to the pro game? So, in the long run do you think it was to your benefit to get that taste of pro hockey last season? What do you have to do to reach your ultimate goal of playing in the NHL?